This page had 281938 visitors. Our firm is very complex, it performs real estate value appraisements, technological expert reports, investment consultations, value analyses, feasibility studies, real estate development analyses, sensibility surveys and related legal administration at short notice with the highest standards and modern quality equipment. We carry our activities throughout Hungary and we have a remarkable reference list. Our staff does high quality work with specialized knowledge, big routine, and trustworthiness, keeping in mind the actual related regulations and always emphasizing the client's interests. Our company has professional liability insurance and has never paid penalty or compensation, never took part in any litigation or in such proceedings and does not have any obligations. Our company is member of the Hungarian Real Estate Association, our co-worker is member of the Budapest and Pest County Chamber of Engineering as well as the Budapest Justice Experts Chamber. 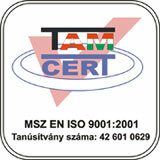 Our company achieved ISO 2001 qualification in 2006.